We always say, "It is all about the little things". So true right? Well, today's post is literally about the little things; keys. How many times are you about to run out the door with full hands and suddenly you stop in your tracks and wonder, "Where are my keys!?" 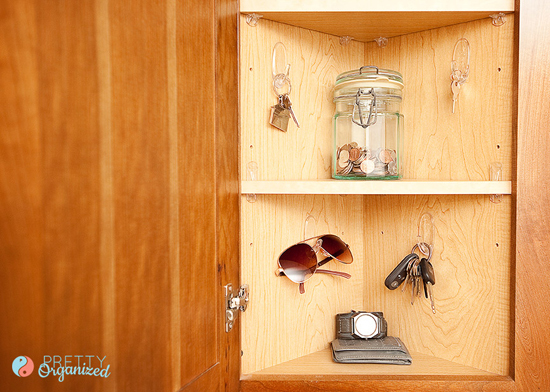 Casey from Pretty Organized Blog is stopping by today to share her simple key storage solutions. 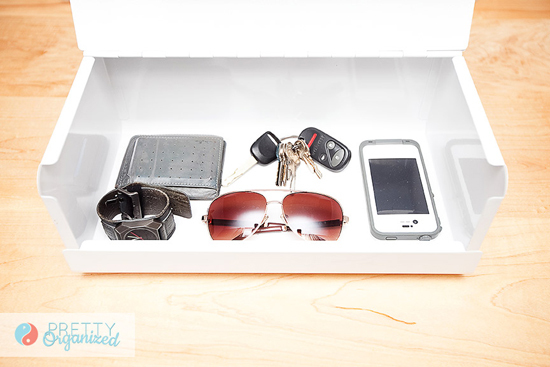 Do you have trouble finding an easy spot to stash your keys, wallet, and all of the little necessities that empty from your pockets at the end of the day? We always ended up with a pile of junk on our counter (and an endless search for keys!) until we figured out these quick solutions. 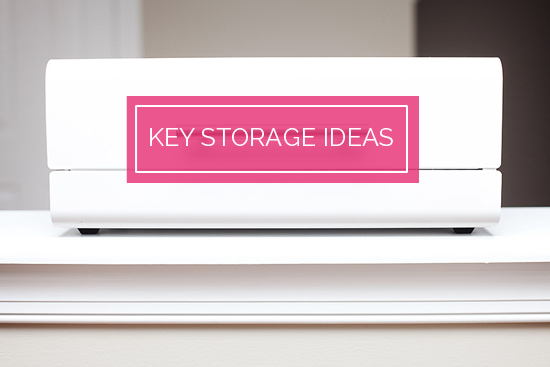 Here are two different ways that we've corralled our key clutter over the years. When it comes to storing entryway odds & ends, there are only two rules: hide the mess, and make it easy to access (aka within a few steps of the main entrance). We used this little guy ALL the time at our old house. It was great for the hubs, because he would always unload his wallet, keys, and any random odds and ends from his pockets at the end of the day. No matter how much stuff we packed in there, it always looked neat & clean when it was closed! When we moved into our new house, we noticed that we had an awkward little corner cabinet near our main entrance. We couldn't figure out what would fit in there, until one day it dawned on us: it was the PERFECT size for keys! A few command hooks, and everything is organized and easy to grab. We even have space for our spare change jar! I love that I can just shut the door (or close the lid) and everything stays hidden away -- one less mess on our kitchen counter! How do you organize all of the small things that come through your door every day? "My name is Casey, and I live in a sweet, tiny little house in Delaware with my hubby & our two adorable rescue dogs. As a longtime fan of Jen's phenomenal organizing skills, I am absolutely THRILLED to be a contributor for IHeart Organizing! 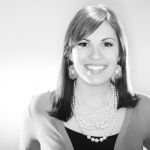 I used to be a total mess, but after I let go of the idea of “perfect,” I found freedom. I stopped trying to fit the mold & learned how to make organization work with my natural habits, and I have become obsessed with creative organizing solutions ever since! When I'm not drooling over the latest amazing project features over here, you can find me happily tinkering away on my own blog, Pretty Organized, where I share my addiction to aesthetics, small space storage ideas, DIY projects, and all things aqua!" We have a black iron shelf hanging by the door. It has a shelf for new mail and then hooks (about 6 of them) for both sets of keys, dog leash, spare keys etc. Love the bread box idea! Genius!! Quick question though, where did the blog contributor purchase her bread box? I love how the lid holds itself up. Great ideas! I'm forever losing my keys around the house! Where did you get your cute breadbox? I love that idea for the bread box. Brilliant. I have a little bowl near our front door but it looks so messy to me with the letterbox keys, spare change and other flotsam in there all the time. I have a small box I could use there instead. Thanks for the inspiration! 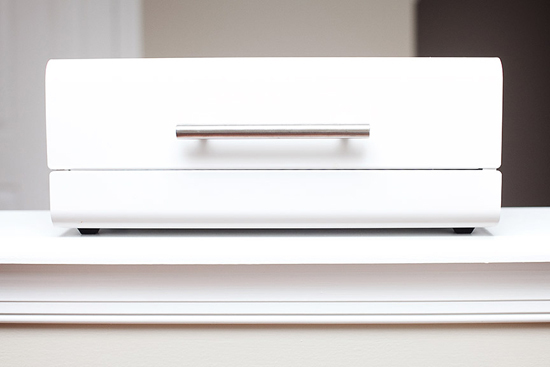 Love the breadbox idea as a drop zone for the hubs! Where did the author get that breadbox from? It's so pretty and doesn't look at all how a breadbox usual does. What a great idea to use a bread box. We currently have a tray on the end of our kitchen counter and I hate how cluttered it always looks. Getting a bread box this weekend! Thank you for always having bright ideas to help keep things neat. I love the bread box idea! Plus I love the design. It's perfect for my front hall. Do you know where I can get one? What great ideas! I really love the bread box idea. If we didn't have a key hook by the door I would totally use it. Thanks for sharing! WHere did you score that breadbox? Weird, I live in the Netherlands but have that EXACT SAME breadbox XD We actually use it for bread but we have a little basket in the hallway where we can drop (and always find!) things like keys, wallets en sunglasses. I need to do that bread box idea! Where is that white bread box from? Where is this bread box from? I love it! Bread box i think this one looks like it.. The breadbox idea is brilliant! I definitely have not thought of that purpose before. For our house, we have cloth pockets sewn together vertically then attached to the door panel from the inside. They have quite an ample amount of storage space for all things little. We have letters chucked in there, keys, elastic bands, and even screws. Now to think of it, I think those little pockets need some cleaning to be done. Well, at least they stay out of the way and out of sight, which is the most important.